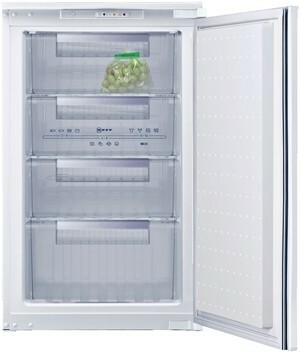 The under counter NEFF G1524X7GB Freezer is very spacious with 94 litres of capacity. The four clear fronted drawers make it easy to store your items and find them again when dinner-time beckons. You can quickly freeze fresh items by selecting the SuperFreeze function. This useful feature drops the temperature to allow new items to freeze quickly and safely, the temperature of existing contents won’t be affected, helping food to retain its freshness. It's best to use this function before going shopping (or an hour before putting new food in). A freezer malfunction warning signal provides peace of mind. While, removable magnetic door seals allow for easy cleaning, simply pull them off, clean and replace. With an A+ rating for energy efficiency it will also save you money on your household bills.